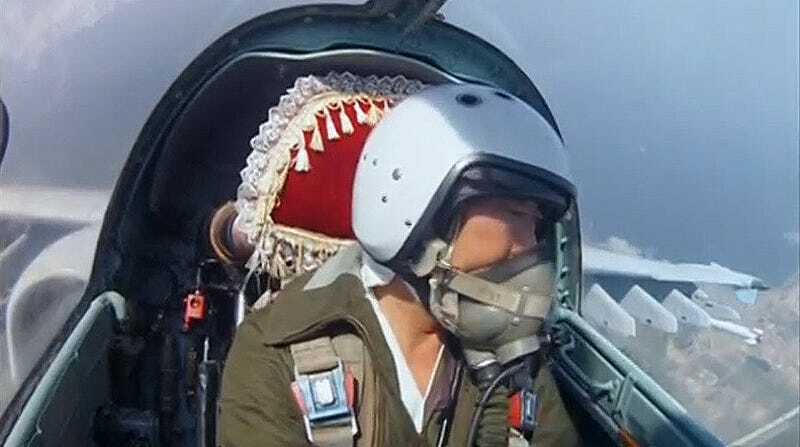 In some screen grabs obtained by Alert5.com of footage aired on North Korean state television of their Su-25 and MiG-29 pilots in action, it is clear that lace and red velvet headrest covers on ejection seats are “in” this season in Best Korea. Also notable in these photos are what appears to be some pretty ill-fitting oxygen masks. This is not the first time we have seen similar gaudy accouterments on a North Korean fighter. Last year, Kim Jong Un visited his “elite” MiG-29 force that protects Pyongyang, and even squeezed into a cockpit to give “field guidance” on how to win at air combat. During the visit, a similar doily was present, although at the time it was thought it was just a special thing for the Young General’s comfort. Well, now we know that is not the case!